Amsterdam, the capital of Netherlands is said to be a city with heart. The polycentric city of Amsterdam has its heart and soul lying in its ring of canals and bridges that bind the concentric and infinite loop that the city is. The city is popularly called the ‘Venice of North’, for its more than one hundred kilometers of canals, around 90 islands and about 1500 bridges. The canals and bridges of Amsterdam are as typical a symbol of the Netherlands as are its museums and art centres. The city has a very strong cultural and artistic identity. Amsterdam is the most important cultural and artistic centre to the north from Paris and between London and Cologne. Art galleries play a major role on the rich cultural scene of Amsterdam – along with theatres, concert halls, museums, libraries, design centers, and periodical events such as cultural festivals and art fairs. Amsterdam is known for its heavy-hitters of art history – Rembrandt, Vermeer, Van Gogh. The city of museums is the one of the most important destination for the art-mappers of the world. Architecture is also a physical manifestation and expression of art and there is no surprise that Amsterdam has become renowned as the City of beautiful Bridges. Linking the city’s distinct neighborhoods through an intricate, slowly evolving web, these structures – some of which date back more than 350 years – help bicycles, scooters, locals, tourists, cars, horses, cats and dogs across its roads and over its waters. The very famous and different city bridges like Magere Brug, Nesciobrug, Torensluis, Hogesluis and Blauburg etc. offer a view of different cityscapes through their eyes and ears. 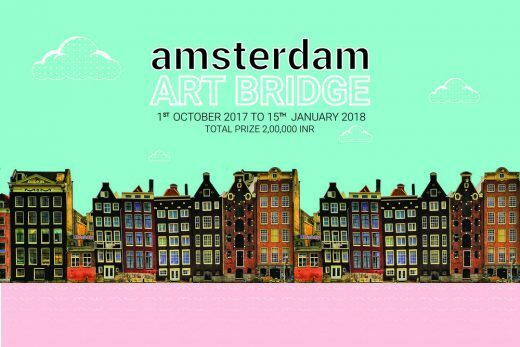 The aim of the competition is to design an iconic pedestrian bridge in the heart of Amsterdam that will also function as an art gallery, performance venue and a very dynamic public space. The proposal must not only attend to the specific function but the design should also take into consideration the urban insertion and impact geared towards creating a new architectural symbol for a European capital city. Innovate and redefine the aesthetic approach towards designing a bridge. The bridge is a structure built to link two points that are separated by physical obstacles such as a water body or undulated terrain. Footbridges or pedestrian bridges are designed to span relatively shorter distances and provide passage over the obstacles. Pedestrian bridges are light-weight insertions that are designed to take the load of people on foot and even cyclists, rather than heavy vehicular traffic. The competition asks the participants to reinvent the structure of a bridge as a sculptural and artistic expression so that it complements the landscape. Participants are encouraged to invent innovative contemporary structural systems for the bridge that add an architectural twist to the very basic functional design of the bridge. The aesthetic quality, materiality, volume and form of the bridge should add vitality, beauty and a sense of identity to the structure. Insert the aspect of a museum/gallery space on a pedestrian bridge to promote art as an inclusive expression and increase the overall vitality of the bridge. participants should incorporate an on-the-way art district over the pedestrian bridge. The participants should try and break the exclusivity of art galleries, design centres and museums by fusing them into a widely-used public space. Art as an expression should reach out not just to the enthusiasts but for general public and tourists. The competition seeks the creation of a museum/gallery experience in a new format by inserting the function on a daily use bridge structure. The idea is to involve and surround daily users of the bridge in an artistic dialogue rather than it being enclosed in a pre-defined space. The bridge-gallery prototype will be an important cultural landmark, giving an extra dimension to a ‘basic functional space’. Enrich community life by injecting, activating and rejuvenating the public space in and around the pavilion. The bridge should become an important landmark and reference point for the inhabitants and visitors of the city, a space that is integrated in the natural environment and that is flexible enough to adapt to a wide variety of activities in and around it. The bridge should rejuvenate the public life in the city and connect people in a more meaningful manner. •	Names of all the participating team members and their respective team leaders. •	Name of the university. •	School ID proofs of the team leaders. •	Participant teams will be disqualified if any of the competition rules or submission requirements are not considered. Participation assumes acceptance of the regulations. •	Team code is the only means of identification of a team as it is an anonymous competition. •	The official language of the competition is English. •	Contacting the Jury is prohibited. •	archasm as the competition organizer, reserves the right to modify the competition schedule if deemed necessary. This is an open international competition hosted by archasm to generate progressive design ideas. There are no plans for the art bridge to be built. The competition is organized for education purpose only.